Huw saw around 45 City games – all of them with me and most of them with Carys too – at 19 grounds. He saw Cardiff play at Wembley 3 times and witnessed a number of near misses as Cardiff flirted with promotion between 2006 and 2011. Huw cheered and admired players over the years like Graham Kavanagh, Peter Thorne, Robert Earnshaw, James Collins, Danny Gabbidon, Roger Johnson, Cameron Jerome, Joe Ledley, Michael Chopra, Jay Bothroyd, Aron Ramsey and especially Peter Whittingham who like Huw, has a beautiful left foot. On 16th April, Cardiff were promoted to the Premier League and will be in the top Division for the first time in 50 years. Sadly Huw would barely recognise the side that has played the last few games – only Marshall, McNaughton and Bellamy remain from the side that Huw adored. 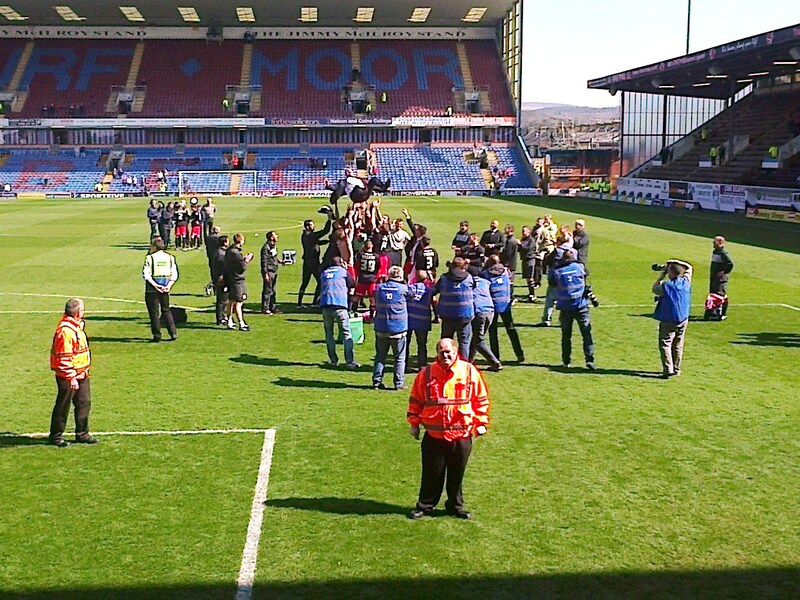 On Saturday 20th April, Carys and I went to Burnley as Cardiff clinched the Championship title – they will now lift the famous old trophy that was lifted by the likes of Bob Paisley and Brian Clough in years gone by. There were fans at Burnley in the Cardiff end with tears in their eyes as they saw their side achieve something unique and a promotion not achieved for half a century. Maybe some of the fans were thinking about relatives and friends who are no longer here? The tears on my face on 20th April were because of two amazing lads who couldn’t be there – elder brother Mark who took us younger brothers as young lads in our first independent outings to see City in the mid 1970s – and who passed away at the age of 48 in 2008. 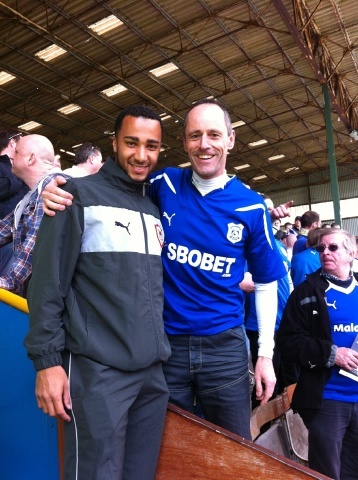 And Huw……Carys and I had some of the best ever days with Huw at City matches – most recently at Nottingham Forest in February 2011. That day we hoped we’d all see City together play in Premiership matches. It was the day that Huw and I talked about Nottingham being a potentially great place to go to Uni. The day a Forest fan shouted at Huw in his Cardiff shirt and threw a chip at him! Huw just stood there and laughed – he was twice the size of the Forest fan . We were optimistic about the future and I was so proud of both Huw and Carys. 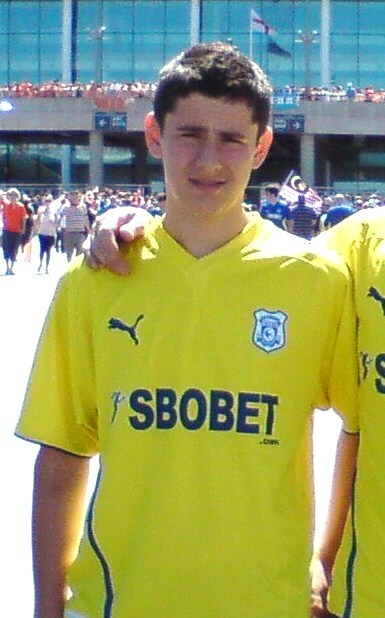 The Cardiff City achievements have been celebrated by my family because they are Cardiff fans and because they have been thinking about what this would have meant for our Huw. I am particularly touched that Huw’s Holmfirth friends look out for Cardiff – they’re not looking out for Cardiff as such – they’re really looking out for our beautiful boy – and it’s that which means so much.